On the recently concluded Philippine Fashion Week last October, I was amazaed on how our clothing brands evolved into something chic even if it's a casual attire. I'm not really into clothing and fashion business but I know how to appreciate clothes when I see one. Being in 30s made me more mature in having my POVs when it comes to what's hot and what's not. Sometimes though there are get-ups that I can't understand or if I pictured myself on that dresss or clothes, I can't help but frown if I will gave the garments some justice. Hahahaha! I so like and love this (is it a pairing of a shirt and a skirt?) donned by Kim Chiu. It's a creation of Randy Ortiz for Bench. I was awestruck! Kudos to Randy and Bench for this piece. See what happens when great minds collaborate? In my perspective, this is definitely an investment. Why? You can use this dress for semi-formal to formal parties such as weddings. Yeah, I have a crystal clear picture of myself wearing this (daydream mode). Now I'm itching to find out where I can buy the exact clothing and so far the lead that I have is the store MYTH where Randy Ortiz is the creative director. It's located at 2/F Greenbelt 5. 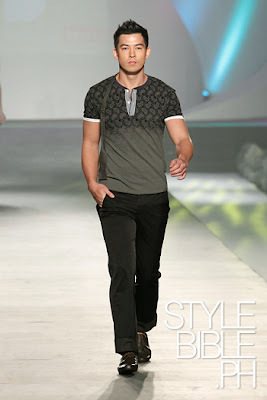 And just now, I found out that the ROB collection featured in Fashion Week will hit Bench Stores this month! Sweet! I need to check out the nearest branch in my place then. I like this shirt for my husband and brother.